Driving across the Lake Somerville dam. 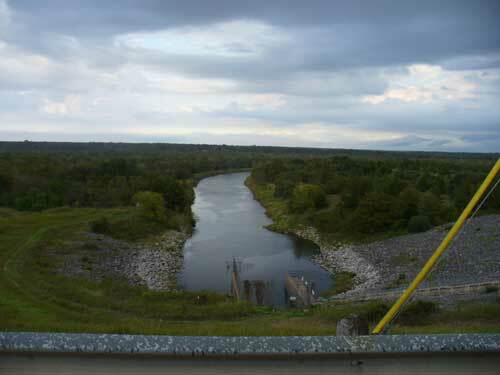 Completed in 1967 by the U.S. Army Corps of Engineers, Lake Somerville controls flooding on Yegua Creek. With about 30,000 acres of water there's plenty of room. The Brazos Sailing Club of Texas A&M meets here. The normal elevation is 238 feet above sea level, it was about 3 1/2 feet low when we were there in mid October, 2006. We rented a cabin at Overlook Park, which is privately owned and has a marina with docks. The cabin was pretty rough but had a great view of the lake from the small deck. Lake Somerville has 7 parks. Two are the Birch Creek and Nails Creek areas of the Lake Somerville State park, we liked the Birch Creek area the best of all the parks. Three are Corps of Engineer parks, and two are private. Starting on the south side of the lake we began at Nails Creek and went all around the lake. Lake Somerville is located on the Yegua Creek in the south central part of Burleson County and the north central part of Washington County, with the upper reaches of the lake extending into Lee County.